Creating a website used to be the domain (geddit?) of professional designers and coders, but thanks to free website builder applications, these days it's something anyone can tackle. We've collated the very best free website builders available, including a mixture of offline software and online tools. It's usually quicker, easier and more efficient to create and edit a site entirely online with a WYSIWYG editor, but if you want complete control over every aspect of your site's design and web hosting, you'll need a desktop-based free website builder. So whether you're looking to create a site for your business, a new blog, or you just fancy creating an online presence for yourself, here are the best free website builder services to help you out. Wix is so polished that putting together your site using the editor feels more like using a native application rather than a website builder, and it also sports excellent support for a diverse range of media, and quality customer support as well, even on the free plan. In addition, Wix Turbo was recently released which improves the performance and speed of all Wix websites. 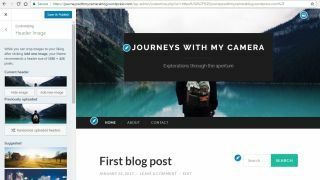 The hosted version of WordPress lets you create your own site on wordpress.com. You can create everything from a blog or photo site, to a fully fledged online store, and there are a number of templates to choose from. Additionally, Mailchimp users have a benefit of adding a Mailchimp block, which can grow your mailing list among other things. Whether you're creating a static site, or a blog-style site with regularly updated content, the online editor is a joy to use and allows just about anyone to create an impressive, professional-looking site. The only downside is the limited range of plugins and templates compared with the desktop website builder. A desktop website builder that has a free version. Incomedia WebSite X5 received an overhaul in April 2019 with new templates, an updated interface, new paid versions and more. The main thing to note is that the service now has a free version for everyone (note that the free version for TechRadar readers is still available to download). There are two paid versions, Evo and Pro, priced at $79.99 and $229 respectively. This is a one time purchase and naturally, both versions come with additional and improved features compared to the free one. There is also a demo version of both paid versions that you can try out. There's a range of ready-made templates to choose from, or you can create your own design from scratch. Next, build up your site map, showing the hierarchy of your pages and how they connect to one another – a feature you won't find in most web-based site builder apps. Once that's done, you're ready to start building your pages using Website X5's simple drag-and-drop interface, which includes tools for editing both rich text and photos. If you don't want to be tied down to an online site builder, WebSite X5 is the tool for you. CoffeeCup Free HTML Editor is one of a dying breed of web building programs that don't use a CMS (content management system). While not in the same league as the likes of Adobe Dreamweaver, Free HTML Editor packs quite a professional punch. With split screen code/preview views, it's possible to see the effect the changes you make have straight away. For absolute beginners, the program might seem a little overwhelming to start with, but it's worth sticking with – assuming you have some HTML knowledge. There is one slight issue; a number of features, such as spell-checking and code optimization, are only included in the paid-for version of the program. Joomla is a well-known name in the CMS world. It may not be as popular as WordPress, but it offers the same two options: build a site using the web app at launch.joomla.org and have it hosted on the company's servers, or download the software from joomla.org and host it yourself. If you choose the latter option, you'll notice that the interface is much less approachable than WordPress. It's not completely impenetrable, but there are lots of menus and options to work through and it doesn't feel quite as polished as WordPress. Joomla's online website builder is nearly as complex, but doesn't involve the same setup process, making it a better option for beginners. Its key selling point is a huge collection of themes and extensions, which provide endless ways to customize the way your site looks and works.